What are the brown jumping bugs I see in my garden shed? They look like spiders? You are probably seeing camel crickets. They love moist environments. They are brown and about an inch long, are high jumpers and will rest upside down. Unlike the common house and field crickets, the camel cricket is silent. You may see them around air conditioning units, in wells or other moist areas like basements, garages, crawl spaces, and utility rooms. 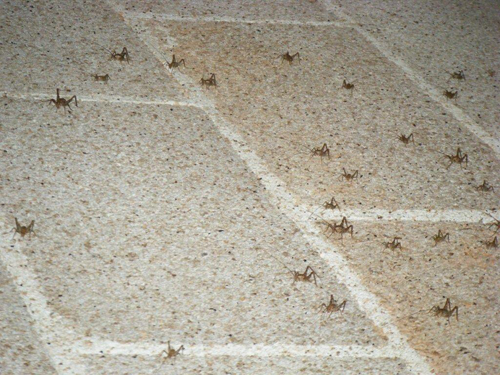 Your pest management professional will use glue boards to trap and detect these pests and baits or sprays to control these crickets. Ventilation, sanitation and exclusion practices are important to prevent their further entry. Why do I see field crickets and house crickets inside from time to time? Crickets are occasional invaders. These are insects that spend the majority of their life outdoors often within close proximity to a house, living in mulch, plants, trees or tree stumps, but, on occasion, will invade a dwelling. These invaders may come inside as they are foraging for food and water. Also because an insect’s metabolism slows down considerably during the winter, they seek shelter to escape extreme temperatures. They do not complete their lifecycle indoors. 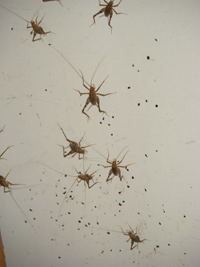 A short list of this group of occasional invaders includes several species of cockroaches, crickets, spiders, ants, box-elder, bugs, centipedes, millipedes, earwigs, mites, scorpions, pill-bugs, daddy-longlegs, slugs, snails, sow-bugs, springtails, weevils, and ground beetles. While these pests may be a nuisance and should be removed for that reason, they rarely do damage or harm. Enviroguard Pest Solutions uses a combination of external chemical treatments and internal non-chemical traps to control these pests. In addition, moving mulch further from your home’s foundation and trimming plants near your foundation may be recommended along with sealing possible entry points.